As you know there are consecrations to Jesus, Mary, the Holy Spirit, St. Michael, etc. etc. I take the words of the consecrations VERY LITERAL. I went to all the classes for the Marian Consecration (33 Days to Morning Glory) and did all the daily readings, but when I read that I would be entrusting my ENTIRE BODY with all its senses and members, my soul with all its powers, good deeds, actions, spiritual goods, etc. 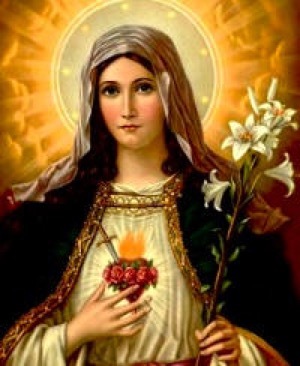 and that “I must first give himself COMPLETELY to the Immaculata as her possession and property and stay in union with her and totally dependent on her” and that some of my duties include, “total gift of all I have and am” and “total dependence on her.” I got scared. To me, if you are COMPLETELY giving yourself to say Mary, that would mean I shouldn’t be open to finding a relationship (dating). How can I TOTALLY give myself to Mary (or Jesus or St. Michael) and leave room for beginning a relationship? I got scared. If I am to TOTALLY (as it says I must) give myself and all these things, then TOTAL means TOTAL. I didn’t go through with the consecration at the very end because of this. If the consecration didn’t mean it LITERALLY, then why else would it be worded that way? So here’s my real question, if I do a consecration to Mary (and COMPLETELY hand EVERYTHING about me over to her) how can I also consecrate myself to Jesus, the Holy Spirit, to St. Michael the Archangel, etc., as well, PROMISING to give them all those things if I’ve already promised it to Mary? How can I do more than one consecration? This is a very good question. You should take the words of consecration literally, but you also have to understand you’re not making a consecration to the natural. You’re making a consecration to the supernatural (Sacred Heart, Holy Spirit) and/or the preternatural (Immaculate Heart, St. Michael, etc). Marriage is a consecration on the natural level, meaning you’re pledging yourself to one man, so you are saying you’ll not share your body or intimate emotions and mutually owned property with another man (or these days, another woman)—fulfilling the two-fold purpose of marriage; the giving of love and the giving of life. But it is preternatural when you consecrate yourself to Mary, meaning your body and earthly possessions are dedicated to her for the glory of God. St. deMontfort promoted consecration to the laity, most of whom were married people with the obligation to procreate. Is the conjugal act a violation of that consecration? Of course not, because it’s commanded by God. No consecration can negate a command of God. When the conjugal act is performed perfectly in accord with God’s laws and intentions, it’s actually a fulfillment of the consecration. In the supernatural/preternatural world there is no competition or jealousy All consecrations ultimately serve one purpose—the glory of God. I have made acts of consecration to the Holy Spirit, Sacred Heart, Immaculate Heart and St. Michael. In no way do they conflict. Instead, each allows me to apply a unique charism to my growth in the spiritual life and patronage in an extra-special way.